Peggy at Angellworks Design knows that window treatments can drastically alter a room's look and feel. With that in mind, her ultimate goal is to help her clients find window coverings and accessories that blend beauty and function. 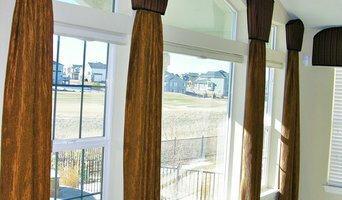 She provides a full line of window coverings from blinds to custom draperies. Angellworks is known for excellent service, attention to detail, and competitive pricing, Contact Peggy to find your perfect window coverings today! A Creative Touch Draperies & Interiors, a US Veteran owned award-winning full-service soft goods firm, specializing in unique, high-quality custom design including wood and fabric window treatments as well as bedding and upholstery updates. We listen to your story and your style and find just the right mixture of fabric, hardware and accessories to make your design dreams a reality. From updating a single room to an entire home, we help you with your goals by providing high quality products, professional customer service, competitive pricing and all within your specified budget. As a specialized workroom, every detail from thread selection to fabric pattern matching and sewing technique is carefully planned from start to finish. This assures that every design is executed with all the concerns of the client in mind, leading to an exquisite design product that exceeds the clients’ expectations. We offer only the highest quality products available and at competitive prices. Our products include blinds and shades from companies such as Hunter Douglas, all types of fabric window treatments, custom bedding and decorative pillows, cushions, custom upholstered furniture, re-upholstery and slipcovers. Listed below are just some of the many popular brands that we carry: Designer Fabrics: Fabricut, Duralee, Vervain, Trend, Robert Allen, Suburban Home, Highland Court, RM Coco, Kashmir, Kravet, Wesco and many more. 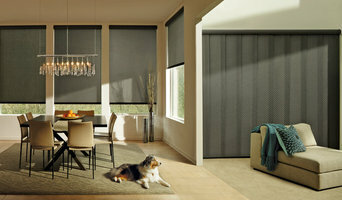 Blinds, Shades, Solar Shades and Shutters: Hunter Douglas, Comfortex, Mariak, Graber, and Kirsch. Drapery Hardware: J.A.B., Kirsch, Brimar Inc, Paris Texas, Finial Company, Byron and Byron, Select, House of Parts, Orion, Royal American Wallcraft, and more. Finishing Touches is an award winning window treatment design and fabrication studio located to Castle Pines, CO. For over 19 years, Sheri Stouffer has served homeowners and interior designers creating unique and beautiful window coverings. In addition to soft treatments, Finishing Touches also carries a wide range of hard treatments from Hunter Douglas to Horizon Shades. As a specialized drapery workroom, every detail from fabrication of the treatment to the final installation is handled by Finishing Touches. This assures that every design is executed with all the concerns of the client in mind, leading to an exquisite treatment that exceeds their expectations. Let Sheri share her expertise and knowledge. Call Sheri on her cell at 813-244-7614 to set up a design consultation. Below are some of the many lines we carry: Designer Fabrics: Kravet, Stout, Carole, Duralee, RMCOCO, Wesco, Fabricut, Trend, Catania Silks, Premier Prints, Norbar, Robert Allen, Maxwell, Greenhouse, Novel, S. Harris and many more. Drapery Hardware Lines: Helser Brothers, Select, Brimar, Forest Group, Design Elements Group, Kravet, The Finial Company, Iron Art by Orion, Kirsch, Rowley's and many more. Blind, Shades, and Shutters: Norman, Hunter Douglas, Horizon, Timber Blind Metro, Graber, Comfortex, Universal, and Insolroll. Rocky Mountain Shutters & Shades was created to give our fellow neighbors in the Denver area an opportunity for high quality products with an excellent customer service experience along the way. Your Top Window Covering Specialists, Serving Denver for 20 Years! Our Northwest Denver custom window covering showroom is located near 38th and Tennyson Street. With 60 years of combined experience, we will help you design the perfect window statement in your home. Our showroom allows you to touch and operate life-sized samples of our custom blinds, shades, shutters, drapery panels, curtains, bedding and decorative hardware. We have over 3,000 top quality fabrics, including the latest in interior design fashions. We are a Hunter Douglas Showcase Dealer and also carry Lafayette Interior Fashions, Graber Blinds and other quality, USA made brands. We also have curtain and drapery hardware from the top suppliers, like Orion Iron & Wood Art, Kirsch, Select Hardware, The Finial Company, Paris Texas Hardware and more! Consider Following Windows Dressed Up to see over 1,500 pictures of the latest in window treatment ideas and designs, as well as ideas for your kitchen, bathroom, living room, home office, bedroom and patio. *Hunter Douglas Authorized Dealer* Blindsmith, Inc. was created with the goal to provide quality products that we trust and services we are proud to offer. Our top priority is to create a customer service experience that makes our customers want to come back. We offer window covering services from start to finish, from custom measurements in your home, to selecting the right product to fit any style and every budget, all the way to expert installation. Our unique cleaning and repair services allow us to keep your blinds in ideal condition for years to come. *Hunter Douglas Authorized Dealer* A Shade Above is a Shop at Home Window Covering business. We bring the full line of Hunter Douglas Window Fashions to You! Shutters - Blinds and Shadings! We have been in business in Arvada since 1989 and cover the Denver Metro area. We also specialize in soft window treatments - drapery, sheers, valances, pillows and fabrics. Window Covering design, Professional Measures and Installations are available. Looking at fabric and color in your own living space is the best way to make your design dreams a reality. You can expect to receive a personal consultation with attention to your needs for light control, child safety, energy efficiency, ease of operation and overall design. Whether you are looking for shutters, shades, blinds or drapery, I bring the store to you! Free In Home Estimates. Windo VanGo offers shades, blinds, shutters & draperies for every room in your home. We are a family-owned company, based in Broomfield, Colorado and have been serving the Denver metro area for over 20 years. Whether you prefer simple blinds or exotic draperies, Windo VanGo can make decorating easy. Some windows are truly a challenge to cover. Windo VanGo offers a variety of specialty shapes such as arch tops, angle tops and skylights. Measured and installed, our prices, service and guarantees are virtually impossible to beat. We have a highly trained staff of Hunter Douglas Certified installers who treat all products and customer homes with the highest levels of respect. We also have a newly remodeled showroom in Broomfield where customers can come and get a good idea of all of the products and their operating systems. Our team is proud of its reputation, and truly appreciate you as customers! Inspired Spaces has created unique Custom Soft Window Treatments and Bedding in the greater Denver area for over 15 years. We also represent Hunter Douglas, Insolroll, Norman Shutters, Comfortex and other hard Window Treatment products. 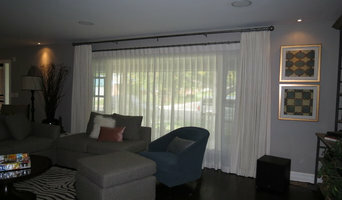 We specialize in Motorization of Blinds and Draperies, and whole house automation. Call today to set-up a Design Consultation with Beth at 303-618-4573. The Denver Shade Company provides exceptionally designed home centered technology solutions including motorized shades and lighting controls. Our core values include Excite, Respect, Collaborate, and Deliver. Jared Layton, principle, has won numerous business and customer satisfaction awards. We offer trade accommodations and are geographically flexible. Bring home the beauty of custom window treatments with convenient on-site assistance from New View Blinds and Shutters. We’re your mobile showroom for unique plantation shutters, horizontal blinds, roman shades, and more. Why limit yourself to off-the-shelf window shades and blinds when we make custom affordable? Stoneside is America's fastest growing window covering company. We offer custom-made residential and commercial blinds and shades. We bring our showroom to you, help you select the perfect window treatments, measure your windows, hand craft your window coverings, install your blinds and guarantee the results. We sell roller, solar, modern roman shades, wood blinds cellular and honeycomb shades, vertical blinds, transition shades, motorized and commercial blinds and shades. We are a custom drapery workroom located at 580 S Broadway in Denver. We've been in business for 25 years. 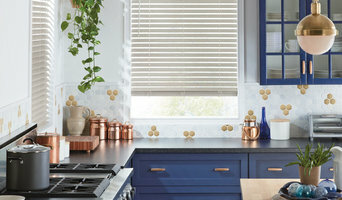 We offer Hunter Douglas, Norman and Elwin blinds and shades in our studio. Our custom drapery services include design, fabrics selection, manufacturing, and installation. Fast delivery, great prices, and professional results. Lu-Tek has served the Window Covering industry in Colorado for over 40 years providing all types of window coverings to General Contractor's, Architects, and Designers.